Freight brokers show their achievements with record albums above their desks at Avenger Logistics. › Service: Arranging of transportation of freight and cargo. Among the nine local companies on the 2018 list by Inc. magazine of the 5,000 fastest growing companies in America, five are related to trucking and logistics. 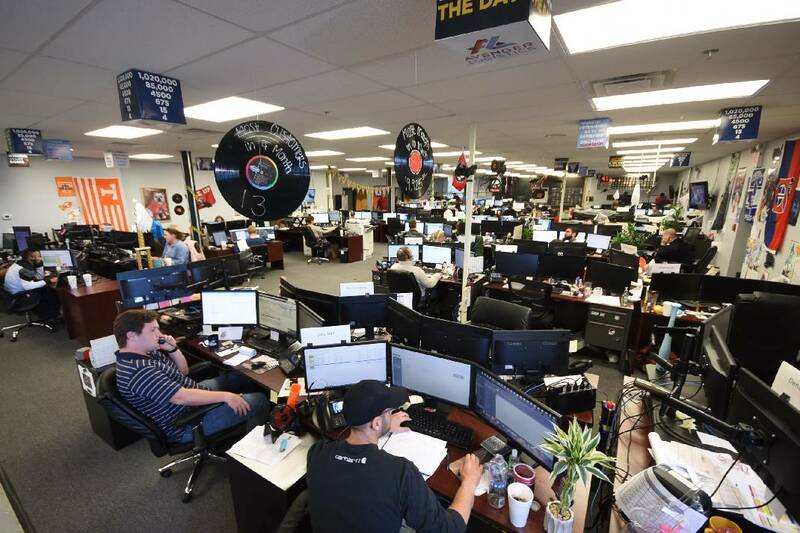 When Inc. magazine released its list in August of the 5,000 fastest growing businesses since 2014, a majority of the Chattanooga companies on the list were in or serving the trucking industry. Five of the nine local companies Inc. editors said had the most rapid revenue growth from 2014 to 2017 were either freight brokers, insurers or transportation service companies. But Chattanooga's fastest growing freight broker wasn't on the Inc. list this year because it is still too new. "What has really made a difference for us is our ownership, leadership and the culture here," said Bruce Clements, president of Avenger Logistics. "We've build a great team; we recruit and train good people, and we're committed to doing what we need to do to serve our customers." Those are lessons many of Avenger's managers learned at Access America, the freight brokerage startup founded in Chattanooga in 2002 that grew to more than $500 million in revenues by the time it was sold and merged with Coyote Logistics (later sold to UPS) in 2014. So far, Avenger is growing even faster than Access America did in its first three years. Avenger, which includes many former Access America managers, started as a flatbed specialty transporter and remains a major heavy hauler. But Avenger is rapidly expanding across all types of industry and freight movements, including flatbed, heavy haul, over dimensional, van, LTL (less than truckload) intermodal, air or ocean shipments. "If you move it on a truck, or a plane or a boat, we want to help," said Jason Roberts, Avenger Logistics' director of business development. "Whether it is one pallet weighing 100 pounds or one piece weighing 200,000 pounds, we can move it for you." Chattanooga is home to two of America's top 10 long-haul trucking firms — U.S. Xpress Enterprises and Covenant Transport — and has a major Amazon fulfillment center. But for all the giants in town and in the industry, more than 80 percent of all trucking companies still have fewer than five trucks and there are still tens of thousands of businesses across North America needing to ship their products via truck, Roberts said. Connecting shippers with truckers able to deliver that freight is the daily challenge for workers at Avenger Logistics. A list of prospective clients is put on the board above Clements desk every day. "We really think we have just begun to scratch the surface for our growth," Roberts said. "We are adding about three or four employees a month and our business plan is to grow to about 100 employees or more by the end of the year." In the company's Shallowford Road office, dozens of Avenger workers make the connections to ship goods all across North America. Several times a day, the gong sounds — and staff cheers go up — when sales representatives achieve another sales target or milestone. Bells ring when employees make new sales and Avenger has regular contests, employee luncheons and other events to make their jobs, which can often by quite stressful, as much fun and rewarding as possible. Each Avenger employee, who the company calls a "team member," handles both the sales and service for each client, rather than splitting the functions like many other freight brokers. Local staff are empowered to make the contract, arrange the shipment and hire the trucking service to meet each customer's need. "We give our team members training and tools to do their job and try to empower them for success in meeting customer needs," Roberts said. Avenger's 11,000-square-foot office includes an on-site workout room with a variety of exercise equipment and, similar to Godsey's other businesses, a chapel for those want to pray, meditate or take time for reflection. Within the next six months, the company expects to move to a new office more than twice as big as its local staff grows to more than 100. Currently, Avenger has one other office in Minneapolis, but others are planned as the business grows, Roberts said. Godsey, who jokes that he retired "for a couple of weeks" after selling Gold Bond to his son and briefly running an outdoor sign company, said he was attracted to the trucking business while traveling to Florida and seeing the number and variety of trucks on the road. But in exploring the industry, Godsey discovered that freight brokers that arrange shipments but don't actually own the trucks or equipment are often more profitable and less risky. "We are more than simply a transportation resource for our customers – we are truly strategic partners, serving a key role in the success of their supply chains," Godsey says on the company's web site. "We're here to listen and respond to your ever changing needs."